Joby's Gorillapod Video lets your shake-prone pocket cam cling to nearby pipes, table legs, or skinny trees. Because not every video you shoot with your Flip or Kodak PlaySport or whatever has to be shaky. 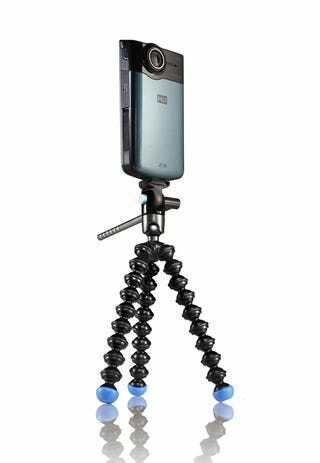 The Gorillapod Video, made of anodized aluminum, has both magnetic feet and Gorillapod's signature segmented legs, so you're sure to find a surface or object for it to cling to or wrap around. It's designed specifically for pocket cams, and features a new ball-head, affording users a smooth 360 degrees of pan and 135 of tilt. And there's a quick release plate for when you need to unlatch from the 'pod and go in for the close up.